We made a few changes to this article on the best sub-$300 acoustics, with a few older models making way for some more current guitars. This included adding three Yamaha models to our list, such as the legendary Yamaha FG830, the smaller-bodied Yamaha FS820 and the new Yamaha APX600 electro-acoustic. 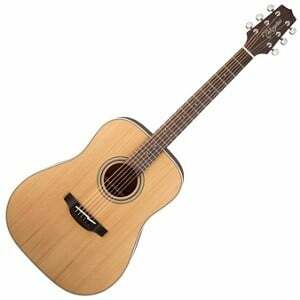 We also saw the return of a very popular acoustic in the Takamine GD-20. Confused by a crowded sub-$300 marketplace? Fear not, because we have painstakingly cut through the pile to present you with a list of some of the best affordable acoustic guitars. Our top ten chart only showcases models that truly deserve your time and hard-earned money. Is it Really Possible to Find a Good Acoustic Guitar that is below $300? These full-sized acoustics would suit both beginners and intermediate players who don’t want to spend the earth on a decent guitar. While we have selected some dreadnought, concert and folk sizes, there are no dedicated travel models here – they have their own article. Let’s get started! 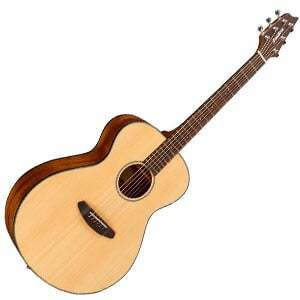 A solid choice from Breedlove – a guitar well worth discovering! A $300 guitar that performs like a $500 guitar! Exquisite acoustic with a solid cedar top. An upgraded version of a classic Yamaha electro-acoustic. A fantastic folk guitar from Alvarez. Beautiful and affordable all-mahogany electro-acoustic from Ibanez. An affordable gem for folk and fingerstyle players. A versatile Washburn performer with great electronics. Affordable performer, taking advantage of the Talman’s sleek looks and playability. An uncommon parlor with a modern sound for today’s player. 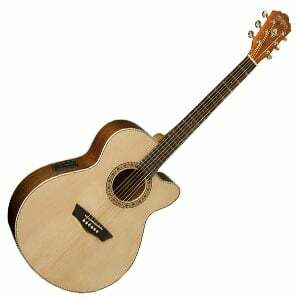 Breedlove make a great guitar, and are a big name in the premium market. But with their Discovery Concert – part of the entry-level Discovery Series – the brand show that they can do things well on a budget too. Made in China, but set-up in the US, this concert sized acoustic offers a rich and bright tone, that projects well, thanks to the solid Sitka spruce top. The back and sides are made of mahogany laminate, while the mahogany neck features a rosewood fretboard and 20 frets. It looks great, sound good, and offers appropriate hardware. What’s not to like? If you want to know more, check out our in-depth look at the Breedlove Discovery Concert. What can we say about the FG830 from Yamaha? Well, first that it is one of the most popular affordable acoustic guitars in the world – and for good reason! It features an elegant but no-nonsense dreadnought style, with a glossy solid spruce top and laminated rosewood used on the back and sides. Playability is excellent, with a matte-finished nato neck and 21 frets to play with. But despite the beautiful design and feel, it’s the sound where this guitar wins. It features a bright and articulate tone with big projection and great overall balance. Ultimately, it performs like a $500 guitar! There’s more on this top acoustic in the full review of the FG830. The GD-20 is a very respected acoustic from the equally respected Japanese brand, marrying excellent craftsmanship, quality tonewoods, and an affordable price. Warmth is the theme of the day with this model, as it features a thick solid cedar top, which is a good alternative from the spruce models that are more common on this list. This is paired with laminated mahogany back and sides, as well as a slim mahogany neck. 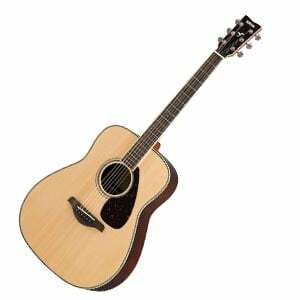 As we highlight in the full review of Takamine’s GD-20 there is no skimping in the hardware department either, as quality components have been used to develop an acoustic that looks, plays and sounds like something a lot more expensive. A new addition to this chart, the APX600 is also a new addition to the sub-$300 acoustic market, having recently replaced Yamaha’s popular APX500III. It is a very similar slim-bodied guitar, although some noticeable changes have been made to increase the playability and quality even further. This includes the reduction of the scale length to 25”, which will be welcomed by both beginners and those with smaller hands. Several improvements have also been made to the appearance, as well as an overall enhanced sound. Most importantly, the overall feeling of value remains, with great tone, serious playability and reliable electronics. As always, the full review of the APX600 has everything you need to know! Give Alvarez $300 and they’ll give you a very good guitar – and some change! 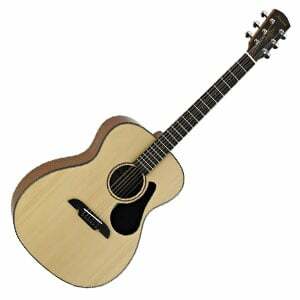 Their Artist Series AF30 is another popular acoustic with a smaller folk sized body and an overall feeling of quality. Playability on the smooth mahogany neck is also excellent out of the box. The body is crafted from solid Sitka spruce on the top (with advanced bracing to aid projection), while the back and sides use mahogany to produce a mellow tone that fits light strumming and fingerpicking very well. With lighter projection, it’s an excellent guitar to accompany vocals or for traveling around with. It’s hard to criticize this one, especially for the price. You can read more about the Alvarez Artist Series AF30 in our full review. Part of Ibanez’s impressive Artwood series, this affordable AW54CE is a beautiful specimen, featuring a classic single-cutaway dreadnought body. The back and sides are crafted from laminated mahogany, with a solid mahogany top – a nice addition to a guitar in this price range, that helps give a warm, rich sound. The body features a rustic open pore finish, while the mahogany neck sports a more hand-friendly satin finish, as well as a rosewood fretboard, with 20 frets. As we mention in our full review of the AW54CE, the guitar has plenty of quality components that make it stage-ready. Primarily the simple but very functional Ibanez AEQ210TF preamp with a Fishman Sonicore pickup, volume controls, 2-band EQ, and an on-board tuner. Another Yamaha acoustic worth your attention is the FS820, which will certainly appeal to the fingerstyle players out there. Unlike the dreadnoughts we have featured on this list, this one sports a compact concert-sized body, which looks great, is available in several colors, and is comfortable to play. As we have come to expect from Yamaha, this acoustic is crafted with care, despite being a mass-produced affordable guitar. The materials stand up to scrutiny too, with an attractive solid spruce top matched with laminated mahogany back and sides. This all leads to a surprisingly good projection and a balanced tone that’s bright and clean – perfect for folk and fingerstyle playing, as we mention in the complete FS820 review. Part of Washburn’s solid-topped Harvest Series, the WG7SCE is an all-round versatile, hardworking acoustic that would be a great match for intermediate and experienced players who perform regularly. With earthy good looks, thanks to the cool inlaid wooden rosette, the Grand Auditorium-sized WG7SCE is a very well-crafted instrument, using solid Sitka spruce on the top, with a laminated mahogany on the back and sides. This combines to deliver a mellow, rich tone that remains focused. The tone is naturally amplified through the Washburn-designed preamp, which – impressively for this price range – offers 4-band EQ, a digital tuner, and a notch control. Take a closer look at the excellent Washburn WG7SCE in the full review. 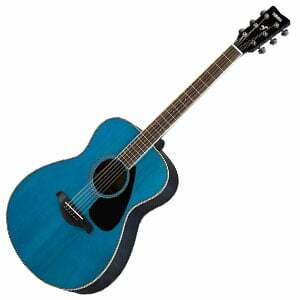 With Ibanez’s distinctive double-cutaway Talman body shape, the very affordable TCY10 electro-acoustic has plenty to offer players. The back and sides are made from laminated mahogany, with a laminated spruce top, and comes in three attractive colors (black, blue and vintage sunburst). It also features a very comfortable and fast-playing mahogany neck – highlighted in our full review of the TCY10 – with a rosewood fretboard and 20 frets. Even though the tone lacks a little low end, the natural sound can be tweaked with the included Ibanez AEQ2T preamp system. This features an under-saddle pickup, 2-band EQ (bass and treble), and a handy built-in digital tuner. 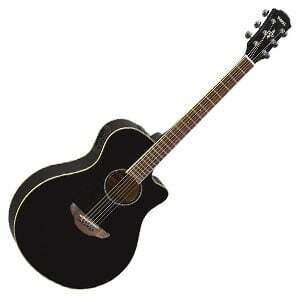 For such a wallet-friendly price, this sleek acoustic is very suitable for beginners and experienced players alike. The CP-100 by Fender is not like most parlors. It has a sound that is bigger and fuller than the body would make you believe. The mahogany neck joins the body at the 14th fret, which gives you easy access to two more frets. The body is made of all laminate with a spruce top and mahogany back and sides. Graph Tech provides the nut and saddle, which is a nice touch instead of plastic. The bridge and fingerboard are both made of rosewood. The top has a satin Sunburst finish. The neck finish is also satin, which makes for a smooth and fast playing experience. It has a modern and warm sound, which will turn-off the vintage crowd. Of course it is! There are so many good builders out there that are competing for your attention. The only way they can beat out the competition is by building the best guitars at the best price. If you spend more of course you can get a better guitar, but if you are constrained into this price range there is plenty good stuff to choose from. If you are sure that you are looking for a nylon-stringed guitar within this budget, check out our article about the top classical guitars under $300. Take the time to look through our list, and that will be the best place to start. If any of these guitars look really good to you, then read through our extended reviews. Check out our other lists if this is not the right price range for you. There are so many options, don’t restrain yourself by not seeing what’s out there. I purchased last summer at a garage sale a Segovia Model DC70GN it has a cutaway and it was made in china , I paid $25.00 and it came with a small amplifier. I can’t believe its a cheap guitar a side from being in perfect condition , The od thing about it is the action is unbelievable easy all the way to the last fret and the sound is unbelievable as well . I put a set of Elixir strings 12/55 on it . This guitar puts my Yamaha FG700s to shame . Is that a fluke or what. My next step is to lower the strings on the yamaha to see if I can get that close like the segovia. The last Gibson humming bird I played was about the same action as my Segovia except that gibson wins over with its sound.